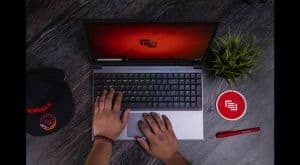 MainGear Pulse 15 Gaming Notebook Announced | Nerd Much? MainGear has announced a new iteration in their Pulse line of notebooks. The MainGear Pulse 15 is one of the most portable gaming laptops on the market with one of the thinnest and lightest designs we’ve seen to date. The design of the Pulse 15 is not just impressively slim, it’s historically slim. MainGear is touting the device as “the thinnest notebook available with a mechanical keyboard.” It comes in at only .86 inches and sports a “weight saving design.” The device comes with a matte ultra-slim bezel 1080p 144Hz 15.6 inch display in the form factor of a 14-inch notebook. Aesthetically, the exterior of the notebook features a slick gunmetal gray brushed aluminum look with black accents throughout. The mechanical keyboard is impressive in its own right on the portable device. The Pulse 15 features mechanical switches, individually customizable RBG keys, and replaceable keycaps for your gaming notebook. There will also be a variety of customization options for the MainGear Pulse 15. The company is offering a new paint process which will allow you to implement your own designs onto your Pulse 15 via a seven step paint process. The process applies full coverage artwork to the device and then finishes the job with a high gloss automotive paint finish for protection. The device sounds like a perfect gaming option for those constantly on the go. The MainGear Pulse 15 will retail at $1,399. You can find out more via their site here.